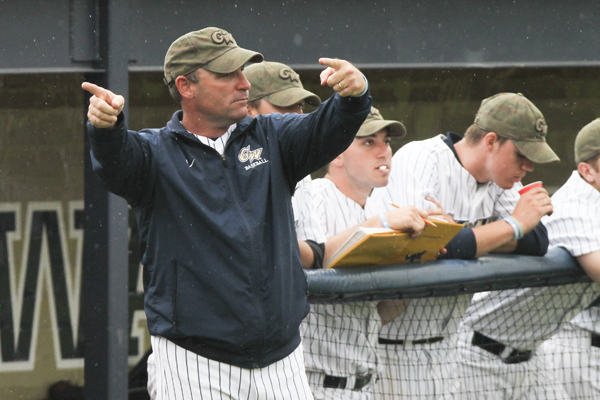 Baseball head coach Gregg Ritchie earned the Atlantic 10’s top coaching honors Tuesday, less than a week after watching his team clinch its first conference title since 2006 and leading the Colonials back after an 0-9 start to the year. In just his first season at his alma mater after a 25-year stint in professional baseball, most recently as the hitting coach for the Pittsburgh Pirates, Ritchie was voted this year’s award recipient by the other league coaches. He becomes just the third GW head coach to receive the award, following in the footsteps of former coaches John Castleberry (1989) and Tom Walter (1998). Coming into this season, GW was slotted to again finish at last place in the conference, after finishing last in the A-10 (20-35, 6-18) the year before. Instead, with Ritchie at the helm, the Colonials overcame a 0-9 start to win 15 league games, including eight of their last nine, and grab the fifth seed heading into postseason play. In addition, GW finished second in the A-10 in stolen bases with 104, garnered a 1.55-to-1 strikeout-to-walk ratio – their best since 2001– and tallied just 238 strikeouts on the year, the fewest in the conference. The team’s nine-game swing from last season puts the Colonials in position to compete for their fifth league title in program history and their first since 2002. This year’s tournament will be held at Charlotte’s Robert and Mariam Hayes Stadium in Charlotte, N.C. The Colonials will take on No.4 seed Xavier in the first game Wednesday at 10 a.m.